Brighton & Hove Albion manager Chris Hughton expects a reaction from his players against Cardiff tomorrow after they sat through a video of their 5-0 weekend defeat to Bournemouth. The Seagulls suffered their heaviest Amex defeat when they lost to a Cherries side who ran in four second half goals. Albion have a chance to quickly bounce back with Cardiff the visitors tomorrow in a huge relegation clash. The Bluebirds are five points behind the Seagulls heading into the final four weeks of the season. 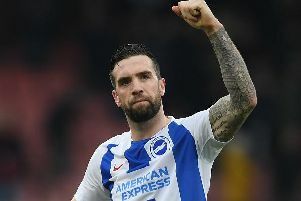 Brighton's players watched a re-run of the Bournemouth defeat yesterday and asked how they have reacted since the defeat, Hughton said: "The players have reacted well. We had the normal meeting yesterday and went through the game and the goals we conceded.